Nintendo announced today a price drop for the Nintendo 3DS bringing the cost of the system to just $169.99… a mere 6 months after launch. Sure, sluggish sales, 3D health concerns and lack of interesting software was partly to blame, but the real reason for the 3DS price drop, is the PlayStation Vita. Full disclosure, I’m a 3DS owners, and a launch owner at that. As much as I love my PlayStation products, I love all consoles, all forms of gaming. So I have zero bias against the 3DS or Nintendo (if it wasn’t for them I wouldn’t be a gamer, and there wouldn’t be a PlayStation). Now that the clarification is out of the way, it’s time to talk Vita. The Nintendo 3DS launched this past month at $249.99 and brought with it revolutionary glasses-free 3D screen. But aside from that, it didn’t have much else that was too groundbreaking. Even the software was, and still is, abysmal. So when it was announced that the PlayStation Vita would have a $249.99 price tag that matched the then 3DS price point, it was only a matter of time before the 3DS dropped its price to compete with Sony’s beast. The Nintendo 3DS is essentially a Nintendo DSi, with a souped up processor, a sad-excuse for an analog stick (and only one, I might add), motion sensors, and a glasses-free 3D screen. But when the 3D almost hurts to play, that 3D screen loses its appeal quickly. 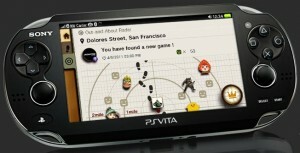 The PlayStation Vita is an entirely new platform in every way. Despite looking like a PSP-1000 but with two analog sticks, the Vita ushers in a never-before seen way to play with the rear touch-panel. Touch-screens have been around for a long while now, and are featured on nearly every mobile device on the market. But a rear touch-panel keeps your fingers out of the way for the main screen, allowing you to see what’s going on on-screen. It may not sound at all innovative in concept, but feeling it in action is a completely different story. It’s very early on, but I’ve already seen both screens used in conjunction to “pinch” and crush asteroids, fingers used to alter the ground underneath an object, and other applications. And that’s just the rear touch-panel. The front touch-screen is a crisp, energy-saving OLED. There’s also two analog sticks, not some nub or “circle pad”, these are real, honest-to-goodness analog sticks with a full range of motion. The specs on the Vita are also much beefier than the 3DS. The Vita can’t gloat about the front- and rear-facing cameras or the motion-sensing; the 3DS has that, too. The 3DS does have some exciting new social functionality. But as cool as StreetPass is–allowing 3DS to communicate with one another by sharing Miis–it’s a passive social feature. There’s no real interaction. There’s online multiplayer, but even that is murdered by Nintendo’s stubborn friend codes. The PlayStation Vita trumps the 3DS’ offering in every way. Near is almost exactly like it in the fact that it passively sniffs out other Vitas. But with Near, it also shows you the location of other Vita players – a great way to hook up for some multiplayer gaming. Party is cross game chat. We’re talking real Xbox LIVE-style cross game chat, allowing users playing one game to communicate with friends playing an entirely different system. This can be done via text messages or using your voice through the Vita’s built-in microphone. Then there’s LiveArea and the Activity stream, which is like Facebook mixed with the XMB. View your friends, trophies, your friend’s trophies, see what they’re playing, leave comments. Pretty much anything you can think of can be done here. The addition of a 3G connection on the more expensive PlayStation Vita model means that these features are accessible no matter where you are in the world, regardless of access to Wi-Fi signals. This is what matters most. And this is why the 3DS is suffering. It launched without any significant games. It wasn’t until Legend of Zelda: Ocarina of Time 3D (a 3D re-release of the greatest game of all-time) released before there was anything of interest on the 3DS. And even that is only a port of a Nintendo 64 title – certainly not enough to lure fans into the $249.99 price tag, and definitely not enough to show off what the system is capable of. Games are coming–Nintendo makes some of the best there is–but it was too late. The PlayStation Vita, on the other hand, has one of the most robust software launch line-ups planned for a handheld. Granted this is still a big if, with the if being if the developers can have their games ready for launch; but it’s still looking better than what the 3DS has even now, 6 months into its lifecycle. It’s not just about variety, although there’s plenty of that. It’s the quality of the titles, and the way they take advantage of the Vita’s unique hardware set. Every Vita game we had hands-on time with–well over ten titles–was nearly PS3 quality in terms of visuals and gameplay. In fact, many of these titles either were from existing PS3 franchises like LittleBigPlanet, Uncharted or ModNation Racers, or they interacted with the PS3 in some way. WipEout had cross-console play with the PS3, letting Vita players race online against PS3 players; I know the 3DS can’t do that. Ruin allowed you to save your progress on Vita to the cloud, then access the save on your PS3 and pick up right where you left off. This goes far beyond even what the Wii U is capable of, since you don’t have to stay within the vicinity of the PS3 to make it work. All of this, and the Vita isn’t even out yet. The 3DS is a great system. Glasses-free 3D is a very cool showpiece. The games aren’t there, but knowing Nintendo, there will be plenty of classics etched into history that will make the 3DS a must have for gamers. But as of right now, that’s just not there, and the price was far too high for the value you were getting. Especially compared to the PlayStation Vita, which is matching the 3DS launch price – at least on the 3G-less entry model. The PlayStation Vita hardware, launch software, and potential are enough value to demand a higher cost than Sony is even asking. Which led to much surprise and approval when Sony announced the affordable price point. The better perception of value overall was enough to drive down the cost of the 3DS. Matching the features, the specs, the games, the 3DS wasn’t enough value to compete with the Vita at the same price point. Nintendo’s move to lower the 3DS price was very smart – it’s the only way to increase the value-to-price ratio as to not look like a total rip-off next to the Vita.